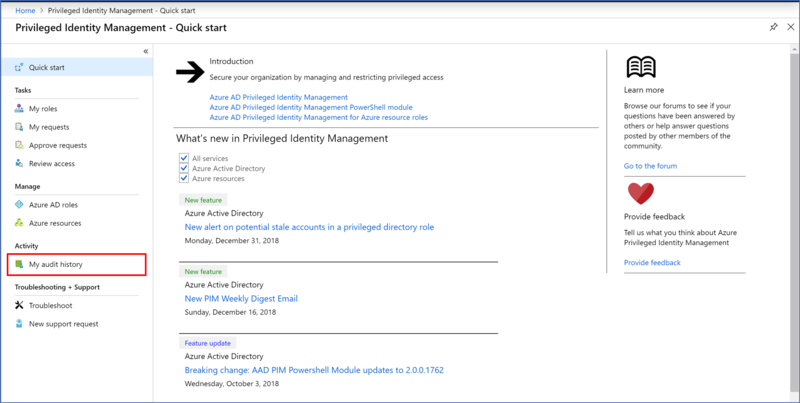 You can use the Azure Active Directory (Azure AD) Privileged Identity Management (PIM) audit history to see all the user assignments and activations within a given time period for all privileged roles. If you want to see the full audit history of activity in your tenant, including administrator, end user, and synchronization activity, you can use the Azure Active Directory access and usage reports. From the Azure portal dashboard, select the Azure AD Privileged Identity Management app. From there, access the audit history by clicking Manage privileged roles > Audit history in the PIM dashboard. You can use the audit history to view the total activations, max activations per day, and average activations per day in a line graph. You can also filter the data by role if there is more than one role in the audit history. Use the time, action, and role buttons to sort the history. Requestor - the user who requested the role activation or change. If the value is "Azure System", check the Azure audit history for more information. User - the user who is activating or assigned to a role. Role - the role assigned or activated by the user. Action - the actions taken by the requestor. This can include assignment, unassignment, activation, or deactivation. Time - when the action occurred. Reasoning - if any text was entered into the reason field during activation, it will show up here. Expiration - only relevant for activation of roles. You can filter the information that shows up in the audit history by clicking the Filter button. The Update chart parameters blade will appear. After you set the filters, click Update to filter the data in the history. If the data doesn't appear right away, refresh the page. Use the Today, Past Week, Past Month, or Custom buttons to change the time range of the audit history. When you choose the Custom button, you will be given a From date field and a To date field to specify a range of dates for the history. You can either enter the dates in MM/DD/YYYY format or click on the calendar icon and choose the date from a calendar. Check or uncheck the Role checkbox next to each role to include or exclude it from the history.